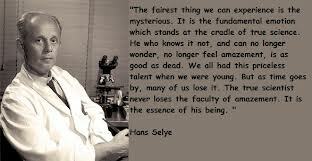 Dr. Hans Selye M.D. was born in Vienna in 1907. After studying in Paris, and Rome he went on to receive his medical degree from the German University in Prague. In 1945 he began serving as the Professor and Director of the Institute of Experimental Medicine and Surgery at the University of Montreal, a position he held for decades. A proud Canadian living in Montreal, Hans was granted Fellowship of the Royal Society of Canada along with 42 other Honorary Fellowships around the world. In addition to these he received numerous honorary citizenships and medals including the highest distinction of the Canadian Medical Association, the Starr Medal and the highest distinction of Canada, a Companion of the Order of Canada. He was internationally recognized as the “Father of Stress” and authored over 1500 technical articles and 32 books in his lifetime including “The Stress of Life” and “Stress Without Distress”. Hans formulated the entire theoretical concept of stress which revolutionized our understanding of both mental and physical illness, opening new avenues of medical treatment. Stress was his life’s work and the world is a better informed place for it, despite the fact that the amount of stress we experience daily continues to increase exponentially. Without question, Dr. Hans Selye was one of the greatest pioneers of 20th century medicine and the world’s most respected scientist in the field of stress research. From a scientific perspective, Hans Selye is unarguably an icon, no less important than Freud, Einstein, Darwin and Newton, just maybe a little less well known by the public. As surely as the laws of gravity keep us grounded and straining to be released from it’s hold, the laws of stress impact every waking moment of life. Hans Selye’s findings are responsible for teaching us how to overcome the harmful effects of stress and just how to use stress to our own advantage in any given situation. Utilizing his basic principles, we can all benefit from a man that instructs us how to minimize the wear and tear on both our bodies and our minds so that we can delay the inevitable aging process and optimize our health and wellbeing every day of our finite lives. His legacy lives on today in both “The Hans Selye Foundation” and “The Canadian Institute of Stress” which he co-founded with University of Toronto Professor Dr. Richard Earle who continues to carry the stress torch today, adding great value to the decades of applied research in his life’s mission to help mankind overcome the ravages of stress.